Bored of warm lager and LADS in Teviot? If you want to get under the skin of the city, then trying out some of Edinburgh’s pubs for a taste of real beer is a good place to start. The city has a hidden trove of watering holes, each with their own character, charm, and unique selection of drinks. Tucked away in the secret parts of town, some can be hard to find, but are always worth the trip. The best places to go for a pint in Edinburgh are mapped by Sam in the third edition of Nanu Maps. Nestled into the old vicarage of St Michael’s church in Tollcross, Cloisters is always busy. Alongside prints of Edinburgh landmarks and old maps of the city, you can pull up a stool and enjoy the finest ale selection in town in a completely unique setting, for a really good price. You won’t find your normal IPA range here; the bar keeps guest ales that change regularly along with a cast of gorgeous bitters and microbrewery-sourced beers, as well as a fine set of specialist whiskies. The crowning jewel in their collection has to be ‘Holy Grale’, a microbrewery ale that is not served anywhere else in the world – though it’s also worth trying the lighter ‘Trade Winds’. If that’s not enough, the welcoming atmosphere, log fire and homemade food should be temptation enough. There’s not much to do in Newington past seven o’clock, but the Abbey is a good bet. Good solid pub food, a huge selection of local ales and bitters and comfy seats. It’s always packed with locals – a good sign of a healthy establishment – and it’s far enough off the beaten track to avoid the wide-eyed tourists who are always so thrilled to have ‘found the real Edinburgh’. Additionally, they always show sports – so you can watch the football with a pint and friends, without being annoyed by the boorish crowd that hang around sports bars. An oasis amongst the strip clubs and bookies of West Port, the Blue Blazer is on a back street pokies online just off the main road. 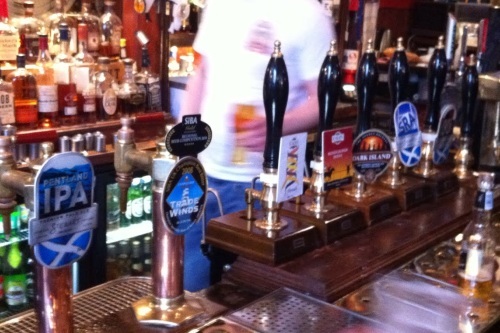 With a great selection of local ales, their IPAs are some of the best in the city. And being a local’s pub, it has the right mix of bookbinders, football fans and students to make for a friendly atmosphere. Pull up a pew or barrel and have a pint, or get cosy in the tap room in the back. Owned by the same proprietors, these pubs have managed to retain their distinctive senses of character despite being located next door to each other. The Pear Tree shows sports and occasionally live music in its large open air beer garden, serving a selection of pale lagers and the usual selection of local beer (Deuchars, Caledonian you know the drill). It also keeps a guest beer on rotation. The Blind Poet is smaller and cosier, and with a more niche range of beers. It also plays better music than the Tree, even if it can be hard to get a seat. In the Fringe, both of these pubs act as comedy venues, as does the Counting House upstairs – the third pub in this beery triumvirate, which is usually only open for functions and private events. One of Edinburgh’s best preserved Victorian public houses, the Guildford hosts a month-long folk festival during the Fringe. With a large gallery bar in addition to the main bar, this place is pretty huge, and the interior is beautiful. Even with its prime New Town location, the Guildford is surprisingly cheap, and in this part of the city its selection of cask ales is unrivalled – highlights include the Flying Scotsman (a brew named in honour of the famous locomotive) and Merman. Doctors is rarely less than packed; situated on the corner of Lauriston Place it serves a fine range of beers and snacks, amongst idiosyncratic surroundings. On first sight it might look like a normal pub, but delve a little deeper and you’ll find some curious features – for instance, the drawers of old medical documents and the forceps framed on the wall. Doctors is a unique pub, and its handy location near campus makes it perfect for post-class drinks (or pre-class drinks. Or mid-class drinks…). Tucked away on Forest Road, not many people know about Sandy Bells, but it’s an experience that’s hard to forget. Inside it’s a nice pub – good beer, good food and always a friendly atmosphere. In the evening though, there’s live folk music every night, either from guest bands and artists or from the regulars. So if you want some traditional, live folk to go with your pint and chips, this is the place to be. Located in Tollcross, across the road from the King’s Theatre, The Cuckoo’s Nest is bigger than it looks. Downstairs from the main bar area there is a whole other room to sit and have a pint in, on some really comfy chairs. Alongside the bitters and ales, the bar keeps a pretty good wine selection. Its real advantage though, lies in its location – close to both the arthouse Cameo Cinema and the King’s Theatre, the Nest offers special food deals if you show them a theatre ticket, and stays open late so you don’t have to go far for an after-show pint. Between ECA and Tollcross, the Brauhaus has a huge selection of European and international beers and spirits to choose from. Although it’s a way off the main strip, it’s worth the trip, for the huge range of choice, and it’s always comfortingly busy with students, hipster locals and people who just like beer.